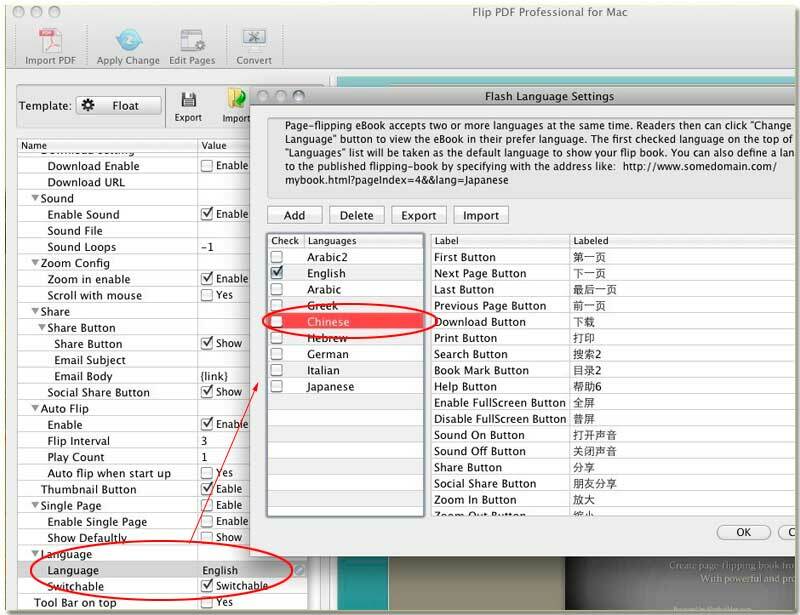 How many language explanations built in FlipBook Creator for MAC? There are so many kinds of language in the world. As international software FlipBook Creator (Professional) for MAC, it must take the element of multi-language into account so that people all over the world can read the output flipbook with ease and get rid of translating before read. Imagine that you visit an online eBook but its function icons explained by other language which you can’t understand right now. Are you still patient? You might shut down it and turn to other interesting readings. To avoid this, you refer to below tutorial which will teach you how to adopt the built-in language to replace English. Step1: Launch FlipBook Creator (Professional) for MAC, and then you know first import a PDF. Step2: find out the option Language from the left settings list, click it to open the window of language customization. In the pop-up window, you view so many languages in the list. There are English, Arabic, Greek, Chinese, Hebrew, German, Italian and Japanese. Also you can add a new language to replace the default English.